Motley and Crue are 3 month old kittens (they look like twins and love one another very much). Rescued from a kill shelter, they are the sweetest, gentlest, most social and adorable little babes. A brother and a sister - would LOVE to stay together. They are tested, vaccinated, spayed and neutered, microchipped and READY for the best home in the world. They LOVE humans of all ages. All cats and kittens are rescues either from the street, abandoned or pulled off the euthanasia list at the city shelter. All are vaccinated, FIV/FELV tested, de-wormed, spayed/neutered (if old enough) and are delivered to your home. If the kitten is not old enough to be spayed/neutered we will do so at a later date, post-adoption. All adoptions require an application and donation. Please find the appropriate contact for this cat by clicking on the picture of the cat. Once you click on the picture you will see an email. If you can not find this you can just email using the default email and the appropriate person will be contacted shortly. Dylan is named after the poet Dylan Thomas. 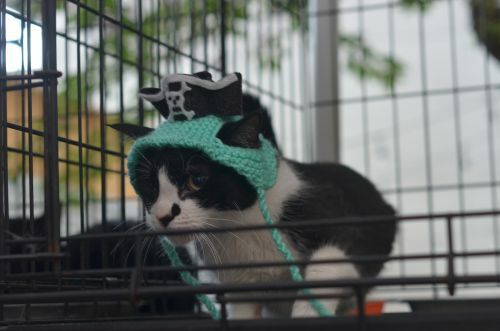 He is one of three "poet" kittens trapped in a Williamsburg backyard. The siblings were scared and somewhat hissy at first but they are coming around! They are about 6-7 weeks old and the most adorable in their kitten plumpness and fuzziness (and a bit of hissiness here and there). We place young kittens in pairs unless there is a pet (dog, rabbit, cat or a kitten) at home already. There are no exceptions. Little kittens need preferably another cat or kitten to play with and learn kitten manners and burn this happy energy. Dylan tested negative for FIV and FELV and received his first deworming and vaccine. He will need his boosters and will be spayed and get vaccinated for rabies when he is 3 months old. He will also get microchipped. All cats and kittens are rescues either from the street, abandoned or pulled off the euthanasia list at the city shelter. All are vaccinated, FIV/FELV tested, de-wormed, spayed/neutered (if old enough) and are delivered to your home. If the kitten is not old enough to be spayed/neutered we will do so at a later date, post-adoption. All adoptions require an application and donation. Please find the appropriate contact for this cat by clicking on the picture of the cat. Once you click on the picture you will see an email. If you can not find this you can just email using the default email and the appropriate person will be contacted shortly. Zofia is named after Polish poet Zofia Szymborska. She is one of three "poet" kittens trapped in a Williamsburg backyard. The siblings were scared and somewhat hissy at first but they are coming around! They are about 6-7 weeks old and the most adorable in their kitten plumpness and fuzziness (and a bit of hissiness here and there). We place young kittens in pairs unless there is a pet (dog, rabbit, cat or a kitten) at home already. There are no exceptions. Little kittens need preferably another cat or kitten to play with and learn kitten manners and burn this happy energy. Zofia tested negative for FIV and FELV and received her first deworming and vaccine. she will need her boosters and will be spayed and get vaccinated for rabies when she is 3 months old. She will also get microchipped. All cats and kittens are rescues either from the street, abandoned or pulled off the euthanasia list at the city shelter. All are vaccinated, FIV/FELV tested, de-wormed, spayed/neutered (if old enough) and are delivered to your home. If the kitten is not old enough to be spayed/neutered we will do so at a later date, post-adoption. All adoptions require an application and donation. Please find the appropriate contact for this cat by clicking on the picture of the cat. Once you click on the picture you will see an email. If you can not find this you can just email using the default email and the appropriate person will be contacted shortly. 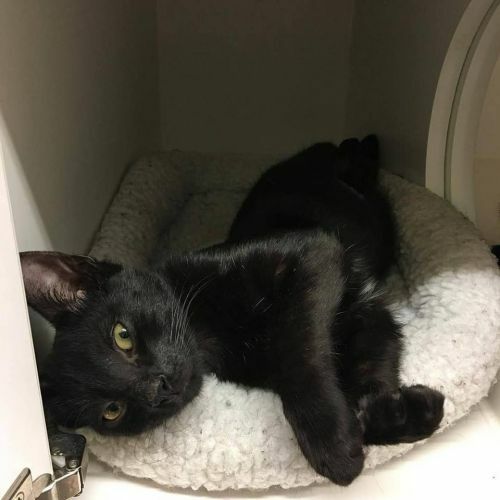 Molly (Ringwald) is an 8 months old female kitten. Molly can be a little shy at first but loves pets and chin scritches. Molly is spayed,, tested negative for FIV and FELV, fully vaccinated and will be microchipped when she gets adopted. You can meet Molly in a pet store in Bushwick where she is staying (akong with a few other kittens) She loves other cats! All cats and kittens are rescues either from the street, abandoned or pulled off the euthanasia list at the city shelter. All are vaccinated, FIV/FELV tested, de-wormed, spayed/neutered (if old enough) and are delivered to your home. If the kitten is not old enough to be spayed/neutered we will do so at a later date, post-adoption. All adoptions require an application and donation. Please find the appropriate contact for this cat by clicking on the picture of the cat. Once you click on the picture you will see an email. If you can not find this you can just email using the default email and the appropriate person will be contacted shortly. 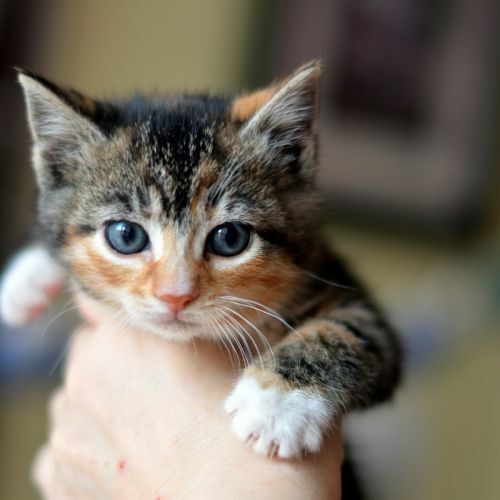 Panda is the only survivor from a litter of kittens born outside to a friendly mom cat. Mom has a home inside now but her little tuxie needs a place of his own. 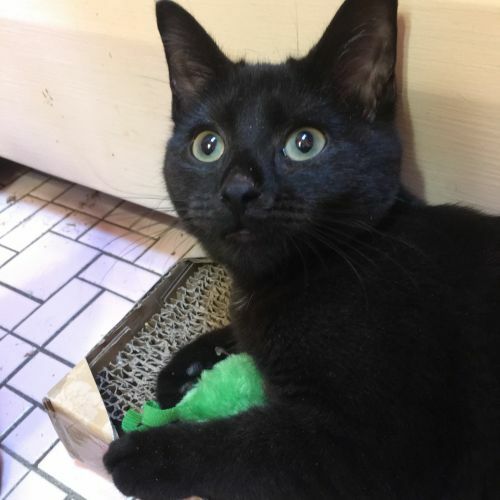 Panda is extra playful and active but will slow down for some lap time and gentle teasing of the grownup cats! Pebbles came to us from the kill shelter as a young kitten. She had a cold with a very bad eye infection that scarred her left eye limiting the vision a little on that side. Sheâs still got a pretty tabby face and it doesnât bother her a bit when diving for toys or dinner! 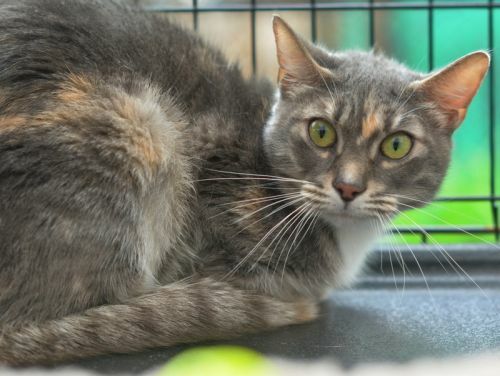 Pebbles is independent but friendly and affectionate. She likes other cats and people but isnât too needy. 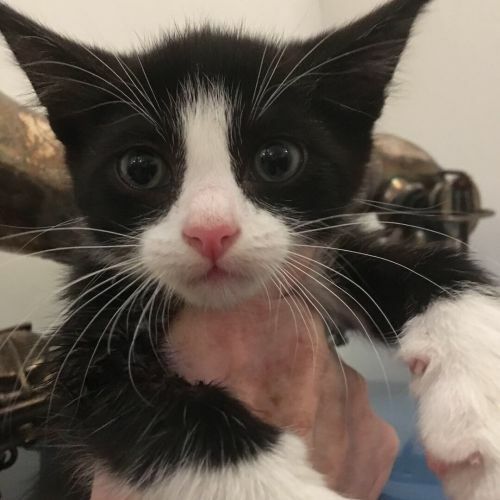 Ollie was rescued from the wheel well of a car on a busy Brooklyn street. He was very fearful and shy at first but now is a loving little guy. 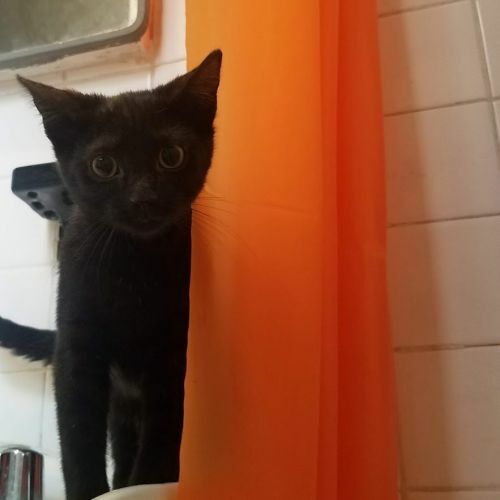 Heâs a little cautious with new people and cats but is easily won over with treats and toys! All cats and kittens are rescues either from the street, abandoned or pulled off the euthanasia list at the city shelter. All are vaccinated, FIV/FELV tested, de-wormed, spayed/neutered (if old enough) and are delivered to your home. If the kitten is not old enough to be spayed/neutered we will do so at a later date, post-adoption. All adoptions require an application and donation. Please find the appropriate contact for this cat by clicking on the picture of the cat. Once you click on the picture you will see an email. If you can not find this you can just email using the default email and the appropriate person will be contacted shortly. Pawvarotti is a gorgeous guy who was found in a backyard in Bushwick, and now he's loving life indoors! We don't know exactly how old he is, but we estimate he's somewhere around 10-12 months. He's energetic and very playful, and he has a lot of personality (you can just see it in his face!)! He also loves getting pets and cuddling with humans. He gets stressed out around other cats, so he'd be happiest as an only-cat. Pawvarotti is about 1 year old, healthy, neutered, vaccinated and tested negative for FIV and FELV. All cats and kittens are rescues either from the street, abandoned or pulled off the euthanasia list at the city shelter. All are vaccinated, FIV/FELV tested, de-wormed, spayed/neutered (if old enough) and are delivered to your home. If the kitten is not old enough to be spayed/neutered we will do so at a later date, post-adoption. All adoptions require an application and donation. Absolutely stunning beauty a 2 year old Becky loves to perch herself on high places. If you don't like cats on your counter she is probably not your girl although I suspect if you offer her a shelf higher than a counter - who knows? maybe she would be persuaded? Games with cats are fun and they are not necessarily played with a string and a feather. Becky is spayed, tested for FIV and FELV, vaccinated and microchipped. She has the most luxurious black silky fur. 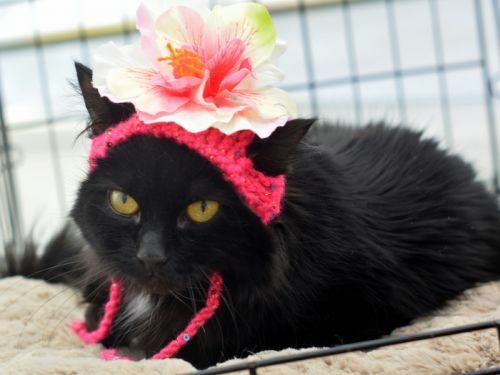 She is fine with other cats, loves people and makes the best decoration on any sofar! All cats and kittens are rescues either from the street, abandoned or pulled off the euthanasia list at the city shelter. All are vaccinated, FIV/FELV tested, de-wormed, spayed/neutered (if old enough) and are delivered to your home. If the kitten is not old enough to be spayed/neutered we will do so at a later date, post-adoption. All adoptions require an application and donation. Please find the appropriate contact for this cat by clicking on the picture of the cat. Once you click on the picture you will see an email. If you can not find this you can just email using the default email and the appropriate person will be contacted shortly. Pirate Odin came to us as a 5 month old kitten. He had an missing eye and was kinda scruffy yet - very sweet. 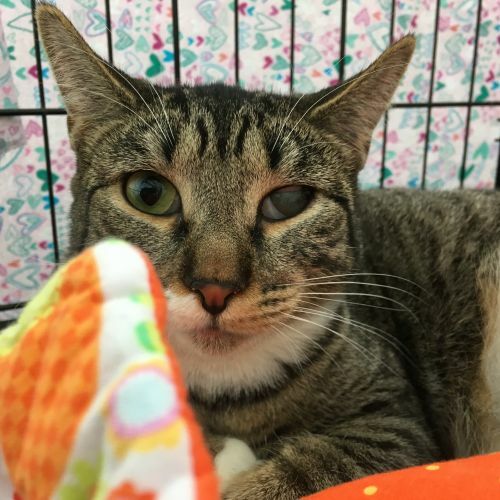 We got him checked out by a vet to make sure that nothing can be done about his eye (enucleation of whatever remained) and were told that en eye patch was in order 😉 Pirate was adopted! Fast forward a year - Odin's adopter had to move for work and contacted us that she cannot keep Odin. So - we are yet again looking for a home for this amazing dude - it will have to be stable, loving and forever. Odin understands that things happen and holds no grudges for being dumped. 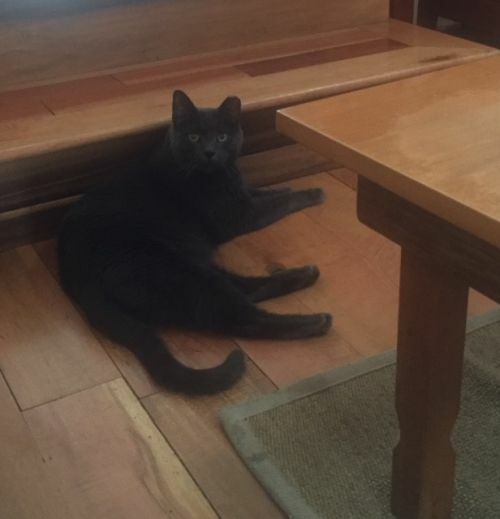 He is sweet natured, cuddly, gentle dude who loves all humans and other cats. Odin is a little over 2 years old, neutered, tested, vaccinated,, microchipped and - awesome. Odin has had a full dental (yes, sometimes young cats have bad teeth) and the remainder of his eye was removed. All cats and kittens are rescues either from the street, abandoned or pulled off the euthanasia list at the city shelter. All are vaccinated, FIV/FELV tested, de-wormed, spayed/neutered (if old enough) and are delivered to your home. If the kitten is not old enough to be spayed/neutered we will do so at a later date, post-adoption. All adoptions require an application and donation. Please find the appropriate contact for this cat by clicking on the picture of the cat. Once you click on the picture you will see an email. If you can not find this you can just email using the default email and the appropriate person will be contacted shortly. Slate is a big, beautiful, well-behaved, gentle soul who loves food, feather toys, and other cats. 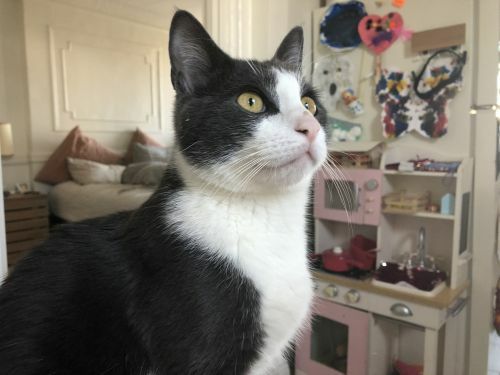 He would make an ideal companion for the cats in a home with at least one other cat, and he probably would do well with a cat-friendly dog. Slate is something of a fearful soul, but he's a kind one whose size, beauty and gentleness will make you love and accept him as he is. But if you also want to try to slowly bring him out of his shell, he will eventually come along. He secretly loves to be petted and he will slip into bed with you when he thinks you don't notice. It's the start of a beautiful relationship.